Surajya movement has yielded us self-governance and since independence, significant progress has undoubtedly been made across several fields. However, the present political and governance culture has reduced this hard-earned Suraj to Swaha-raj where public good has become merely incidental to the fulfillment of vested interests of a distorted political culture. There is a pressing need to build a credible, just, and equitable society that provides dignity, justice, and opportunities for all. With this goal, Surajya movement was launched as a citizen movement by Lok Satta Party on 23rd (77th Death Anniversary of Shaheed Bhagat Singh) of March, 2008 at Hyderabad. Gymkhana Grounds, SP Road, Secunderabad. The Swaraj movement sought freedom from colonial rule through non-violence and non-cooperation. The surajya movement aims to free citizens from the chains of corrupt and distorted rule through the power of the vote. In the present distorted political culture our hard earned Swaraj has reduced to Swaha-raj where vested interests have overthrown public good. a credible, just, and equitable society that provides dignity, justice, and opportunities for all. Since its inception in 1997 Lok Satta Movement has been the driving force of political and governance reform agenda in India. The last decade has been very productive in terms of several key improvements in our governance . With the objective of deepening the political and governance reform movement and creating a new political culture Lok Satta Party was launched in 2006. Where the mainstream political culture has proven to be parochial and divisive, Lok Satta's New Political Culture transcends religion, caste, region, and language. 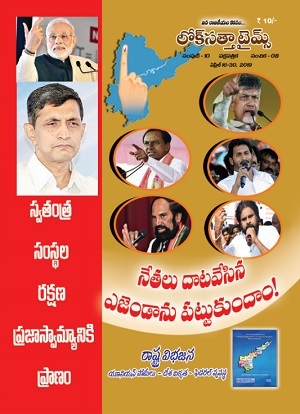 Since its launch, more than 350,000 citizens in over 95% of the towns and cities of Andhra Pradesh have become member-volunteers of this New Political Culture. The Swaraj movement has yielded us self-governance and since independence, significant progress has undoubtedly been made across several fields. However, the present political and governance culture has reduced this hard-earned Swaraj to Swaha-raj where public good has become merely incidental to the fulfillment of vested interests of a distorted political culture. There is a pressing need to build a credible, just, and equitable society that provides dignity, justice, and opportunities for all. With this goal, Surajyamovement was launched as a citizen movement by Lok Satta Party on 23rd (77th Death Anniversary of Shaheed Bhagat Singh) of March, 2008 at Hyderabad. Leading civil society activists of India Mr. T.N Seshan, Mr. Shiv Khera, Mr. Devasahayam, Mr. Julio Rebero, Mr. Ramanathan, Ms. Swati Ramanathan, Mr, Aravind Khejriwala, Mr. Suresh Prabhu exteneded their support to their movement. Mr. Sandeep Pandey, Megasasay Award winner, Ms. Madhu Kishwar, doughty warrior for women's rights and Editor, Manushi, Mr. R. Desikanm famous consumer activist and founder, Catalyst Trust, Dr. Jayaprakash Narayan, Lok Satta Party President and other leaders of the Party Participated in launching public meeting of SURAJYA movement. Starting from Andhra Pradesh, Lok Satta is trying to take Surajya to other states and make it a national movement. While the Swaraj movement sought freedom from colonial rule, Surajya movement aims to free the citizens from the chains of a corrupt and distorted rule. While Swaraj movement achieved its objectives through non-violence and non-cooperation, Surajya movement will be based on the power of the vote said Dr. Jayaprakash Narayan. Hyderabad, Mar. 23 - Leading civil society activists of India today regretted that democracy in the country has been turned into kleptocracy and underlined the need for a thorough cleansing of the political system. Taking part in a media conference organized in connection with the launching of a 'Surajya' movement under the auspices of the Lok Satta Party, they said the future would be doomed if attempts are not made to save democracy now. The participants included Mr. Sandeep Pandey, Magasasay Award winner, Ms. Madhu Kishwar, doughty warrior for women's rights and Editor, Manushi, Mr. R. Desikan, famous consumer activist and founder, Catalyst Trust and Dr. Jayaprakash Narayan, Lok Satta Party President. Mr. Sandeep Pandey and Mr. Desikan released a booklet on 'Surajya' movement brought by the Lok Satta Party. Mr. Sandeep Pandey said that "politics has become a profession and not service. People invest in politics so that they can reap huge returns on coming to power. Corruption has been integrated into politics as a result of which funds are siphoned from Government schemes meant for development". Mr. Pandey pointed out that all parties have become anti-people. Parties don't function on democratic lines and some of them have become dynastic. In Left parties, the decision making is centralized. The country is running the risk of losing even its sovereignty since decisions on crucial economic issues are made outside Parliament. He commended the Lok Satta for presenting a clean alternative. Ms. Madhu Kishwar commended the Lok Satta Party for adhering to the legacy left by Mahatma Gandhi, Baba Saheb Ambedkar and Shaheed Bhagat Singh at a time all other parties used them as mere totems. She praised the Lok Satta Party for having a national vision at a time the so-called national parties in Maharashtra shamelessly surrendered to the attacks on non-Maharashtrians in the recent past. Ms. Madhu pointed out that sovereign citizens have been turned petitioners in the present system. She appealed to people to shed their illusion that a Mahatma would rise and rescue them. Instead, every one should strive to change the system. She hoped that the Lok Satta Party will bring about a paradigm shift in Indian politics. Mr. Desikan said that in the Indian set up, panchayats have been stripped of their powers. He pointed out that politicians floated colleges and hospitals merely to make money and not to serve the public. Dr. Jayaprakash Narayan said that the 'Surajya' movement aims at cleansing the political system, put an end to abuse of power, and 'legal plunder', and ensuring that all, irrespective of their birth status, have growth opportunities, that all are equal in the eyes of law and justice, and that people enjoy power at their doorstep. In the morning, a conference of Surajya activists took place at the Press Club. It was addressed by Dr. JP, Mr. Sandeep Pandey, Mr. Desikan and Ms. Madhu Kishwar. The other participants were: Pratti Seshaiah, Karnati Lakshminarasiah, Chandana Chakravorty, Garimella Narayana, Bodepudi Satyanarayana, DVVS Varma, Srihari, Bhumalingam and Mohd. Yaseen.